So you lived to die another day… Colonel. 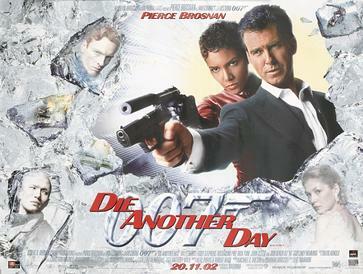 ‘Die Another Day’ has regularly been cited as one of the worst films in the Bond series and it’s easy to see why. At this point in the recap, this is the only Bond film remaining that I’d yet to see (not sure how I missed it at the time), before moving on to the upgrade that would be the Daniel Craig era. On this occasion, the plot revolves around North Korea, where Bond is betrayed, captured and imprisoned. Upon his release as part of a prisoner exchange, Bond sets out to track down the person who betrayed him whilst getting revenge on a North Korean agent involved in his torture with his investigations taking him on a typical globe trotting journey, from North Korea to the beaches of Cuba, London and Iceland. Through his investigations, British billionaire Gustav Graves (Toby Stephens) ends up in Bond’s crosshairs, as do undercover MI6 agent Miranda Frost (Rosamund Pike) and US NSA agent ‘Jinx’ (Halle Berry). Berry gets a strong Bond introduction that pays homage to Ursula Andress spectacular appearance in ‘Dr. No’ but her character isn’t nearly as compelling as many previous Bond girls, Andress’ Honey Ryder included. The first half of the film sets things up reasonably well, with the necessary time given to introducing key characters and motivations being drawn out. There’s intrigue at play, and Brosnan looks like he’s enjoying playing Bond in sleuth mode, trying to crack a case, albeit one that plays out on a world scale. It’s in the second half of the film when things really fall apart, when the previous plot development is seemingly thrown out the window for a series of never ending action sequences and Tamahori forgets everything that makes the Bond films standouts in the genre. One of the main problems is with the editing which is all over the place. It feels like the action scenes are shot more like a ‘Fast & Furious’ movie than a Bond film, and this isn’t helped by some poor CGI that removes any hint of realism from proceedings. Director Lee Tamahori mistakes action sequences for plot development and the second half of the film in particular is a dreary slog through loud explosions, choppily shot chase sequences and over the top gadgets (even for the Bond series, an invisible car is really something). Toby Stephens is doing strong work currently on Starz pirate drama ‘Black Sails’, but he’s not great here as the main villain and his entrepreneur doesn’t fully convince. As duplicitous agent Miranda Frost, Rosamund Pike shows signs of the ability that led her to her career best role in ‘Gone Girl’ but her arc veers too close to Sophie Marceau’s in the previous entry, ‘The World Is Not Enough’, without being nearly as enjoyable. Perhaps the biggest issue with the film is how cheap it looks for a big budget movie. The film had a budget of $142 million but it doesn’t look like it – the production values are dreadful and the special effects are simply not up to standard for a film of this expense. Coupled with a weak story that descends into ridiculousness at the half way stage, ‘Die Another Day’ is a forgettable Bond movie and an ignominious end to Pierce Brosnan’s spell as the legendary spy. After my colleague covered off Daniel Craig’s first two entries last week, we’ll finish off this retrospective with a look at ‘Skyfall’, Daniel Craig’s third outing in the role. Thanks for reading!